I get calls all the time from someone requesting an Elevation Certificate or Elevation Survey. Usually it’s because they’ve gotten a letter in the mail from their mortgage company telling them they have to get flood insurance. This leads them to contact their insurance company and that leads to a surveyor. 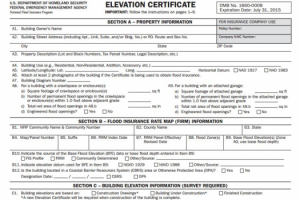 An Elevation Certificate is a form “…used to provide elevation information necessary to ensure compliance with community floodplain management ordinances, to determine the proper insurance premium rate, and to support a request for a Letter of Map Amendment (LOMA)…” Make sure that your surveyor uses the latest version of this form as it’s currently being revised (March 2016). The surveyor determines the lowest floor elevation of the house, the lowest adjacent grade (LAG) elevations of the house, the elevation of the lowest element attached to the house (like a porch step,) and the lowest elevation of machinery or equipment servicing the building. The surveyor also identifies the building type according to the instructions in the Elevation Certificate form. After these are measured, then the Base Flood Elevation (BFE) is determined from either the Flood Maps (FIRM), the Flood Insurance Study (FIS), or by the local community. The difference in elevation between this BFE and the LAG and/or Lowest Floor will determine the insurance premium rate. Even if an Elevation Certificate shows that your house is above the Base Flood Elevation at all points, you still have the requirement to obtain flood insurance. Only after the submission and approval of a Letter of Map Amendment (LOMA) can the Flood Map be amended and the Federal mandate for the purchase of flood insurance be removed. The LOMA process can be done online and typically takes 30 days or less but sometimes a review of the LOMA submission can identify additional information that is needed. It should be noted that the Elevation Certificate must be completed by a Land Surveyor, Engineer, or an Architect who is authorized by law to certify elevation information, though I don’t know of any Architects that will do these, and not too many Engineers. Call ​Hideaway Land Surveying at (903) 525-6405 for help with an elevation certificate or LOMA.